Rovio began rolling out ‘Accounts’, a feature that lets users’ create their own accounts (as the name implies) to save their progress in games across accounts, in May and now the Angry Birds-maker has announced the feature is available worldwide for Android and iOS users. Accounts is currently only available for gamers of the Croods (as it was on launch) and the original Angry Birds title, but the company says it will expand to other Angry Birds and non Angry Birds titles soon. There’s no word on support for others devices as yet. The benefits are quite simple. 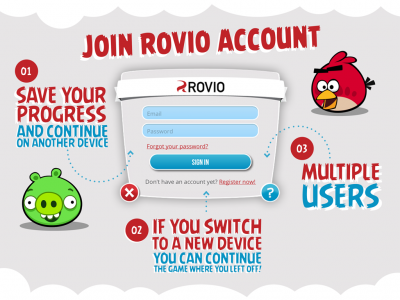 By registering a personal account, Rovio customers can save their progress on games and play across multiple devices from the same level. That means an end to the annoyance of having to play the same Angry Birds levels over and over across different devices. The change also allows multiple users to play from the same device without messing up their respective progress. In addition to benefits for users, the feature gives Rovio a more central point to manage and perhaps increase its interaction with gamers. The company has struggled to recreate the success of Angry Birds with other franchises — like the Croods and Amazing Alex — and it’s entirely plausible that it could use Accounts as a platform to communicate new titles or promotions to users in the future. The Finnish company’s success extends offline and its range of merchandise spans clothing, stuffed toys and even canned drinks. Importantly, Rovio has also branched off into the big screen and — in addition to tie-ins between films and games: such as its deal with The Croods — it is working on an Angry Birds movie. Rovio’s Angry Birds games were downloaded 30 million times over the Christmas 2012 period — with 8 million downloads on Christmas Day alone — as the company saw a record 263 million play its games during December 2012.